Today we are interviewing Jeff Gafford about his action/crime book, "Casting Stones," a Summertown Novel. I am a native Arizonan, I’ve been working in the government and corporate security field for almost thirty years. I’ve been writing for many years, but only began publishing my work about five years ago. Until earlier this year, I was a senior partner in a small publishing company. When that partnership ended, I started my own company, Chaparral Publishing. The main character, Jimmy Stone is almost fully healed from a gunshot wound he received in Summertown, the first book in the series. His marriage is once more on the rocks and he is haunted by nightmares of a past experience. He doesn’t know that someone involved in that past incident is on his way to Summertown looking for revenge. Readers of Crime novels, Action novels. Casting Stones also has a fair dose of humor and small-town drama and romance. So, this book should appeal to a pretty broad array of readers. Tell us about the protagonist, Jimmy Stone. Jimmy is a guy who wants very badly to live a nice, quiet life. He recently married his daughter off to a young man he admires, his in-laws are close friends, he’s very involved and well-liked in the community. But he’s had a very unusual childhood, and some of the angst he harbors from that upbringing finds its way to the surface, complicating what is already becoming a rather complicated life. Jimmy has a friend from his traumatic past visit him. Without giving too much away, can you describe the friendship these two characters once shared? His old friend had been a missionary at an orphanage where Jimmy did volunteer work many years before. They shared a mutual faith in God and a desire to help the very needy. This is a book that draws from multiple genres (crime, action, love story, etc). Did you set out to incorporate aspects from different genres or did the story just develop this way as you wrote? Both, actually. Summertown has a few of these elements, but it doesn’t have quite as much action, not is it quite as fast-paced. There were several sub-plots from Summertown that merited continuation, especially the romantic relationships, and I had hinted at Jimmy’s childhood in the first book. I had outlined Casting Stones with a slant toward more action, but as the characters became more real to me, the more began to happen among them. One of the unique aspects about this book is it alternates between first and third-person point of view. What made you decide to take this approach to telling the story? I wanted to open up the readers’ view of this little world I’d created, but I didn’t want them to have entirely unlimited access to everything that was going on. The first-person POV with Jimmy just made sense to me, since he is the primary character in the book, and first-person is the most intimate of the POVs. Third person is very flexible, which helps to tell the stories of a large cast of characters like the ones I have. IF I’d stayed with third person only, I don’t think the story would have been as emotionally evocative. If I’d stayed entirely with first person, it would have taken forever to complete the book and the reader might have given up half-way through. Can you tell us a bit about your creative process, from initial idea to published manuscript? Until a couple of years ago, I was entirely a “pantser”, a write-by-the-seat-of-my-pants kind of writer who took an idea and let it play out as I went. This is simultaneously fun and frustrating. It also tends to take forever to get a first draft done—which is usually the shortest draft to complete, since the 2nd and 3rd drafts require much more thought. At the suggestion of my good friend and excellent writer, Erik Ekstrom, I began to write a general outline of the direction my stories should go. When I find myself deviating from the outline, I just take a break and reevaluated where my story is going. I usually end up revising the outline and move on, but sometime I find that the story has built up a momentum of its own, so I just let it move. Jimmy was my favorite, simply because many—but not all—of my personal views are held by him. I’ve been asked if Jimmy is a literary version of me. He isn’t; he’s a much better man than I am, and that also makes him fun to write, but his world view is very much in line with mine. A close second favorite to Jimmy is Jason, for reasons I can’t share without spoiling the story. However, I can say that much of Jason Hadley’s character was inspired by a dear missionary friend I knew in Haiti by the name of Tom Northen, who was the kind of man who did whatever it took to get a job done, no matter how tough or dangerous because his love for God and the people around him motivated his every move. No author that I read is a direct model for my writing. But I learn aspects of the writing craft from different authors. For instance, I love to read the humorous style of Woody Allen in works like Getting Even and Mere Anarchy. His style isnnot mine, but it helps to keep innmind that humor is an important part of my writing style and that I can put into a story just about anywhere. I’d like to say that I have learned from John D. MacDonald’s expository style, but I fall very far from the goal of emulating it. Hemmingway’s writings help me to be a brutal as possible with my manuscripts, cutting as much as my fragile heart can handle until only what I think is necessary remains. I am no Hemmingway, but his sparse writing style has definitely helped me during rewrites. To continue to write, to continue to entertain my readers and, hopefully, to make a living. In the words of Henry Higgins in Pygmalion, “Happy is the man whose work is also his hobby”. I think I like the majority of writers out there when I say that just about every aspect of writing is alternately a love affair and a vicious circle of hate. It all depends where you are emotionally and mentally when you’re working. Oh, I’ve been hit hard by writer’s block on several occasions. I combat it with busy work, doing things as unrelated to writing as possible. Gardening, going for long walks, projects at home, etc. Then I sit down and, without looking at whatever writing project I’m working on at the moment, I open a blank document and start typing freely (free writing) until something—anything—starts flowing. It doesn’t matter if it’s good, bad or even intelligible. I just lt it flow. So far, that’s helped me get back on track. I have three works in progress right now: the next book in the Summertown series, which will involve one of the town's most-loved residents in a very uncharacteristic role; a novella revolving around a quiet young man who discovers that someone has managed to invade his mnd; and a non-fiction work of undetermined length on the very simple, uncomplicated subject of Life, the Universe and Everything. 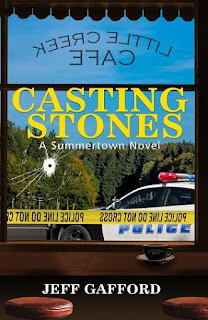 "Casting Stones" is available in both print and ebook formats, not only from Amazon.com and Barnes & Noble, but also at Chaparral Publishing Company's Amazon store: http://www.amazon.com/gp/aag/main/ref=olp_merch_name_1?ie=UTF8&asin=0990552462&isAmazonFulfilled=0&seller=A119GRHNOTCSTP. Jason Hadley sat at what had become his favorite stool at the Little Creek Café, listening to Ken Shirazi talk about his travels in the service. When he saw a chance to cut in he took it. “Oh, you saw that, huh?” Ken laughed. “Oh, Jimmy is family,” Ken said quickly. “I love him like my own brother. We just don’t have the same lives anymore.” He looked down at the counter, forlorn, “He’s been through so much that a…kind of a different side of him seems to show itself sometimes. Some kind of defense mechanism, I guess. He tries to hide it, but…” he shrugged. “No,” Ken replied, shaking his head. “We’re too much at the mercy of the weather. It can really snow heavy out here and then no one but the dedicated coffee addicts come in. For Jimmy not to come for coffee, it takes some serious weather,” he laughed. Jason mentally noted the label “Catholic Christian”. So many Protestants ostracized their Catholic brethren for praying to saints, that they were careful about who they considered a Christian, despite a shared belief in the same God, Messiah and Holy Spirit. If only they were as careful about their own beliefs. “He’s a rare one, alright,” he said. “He is,” Ken replied proudly…but did Jason detect the slightest tinge of jealousy? “Yeah, God has really blessed us. That’s for sure.” He said it sincerely. Ken and Jason looked at each other and smiled. “Alright, spill it. What did you hear?” Ray asked. “Well, apparently,” Ken began, smiling, when a small spray of red suddenly erupted from the left side of his head and a coffee pot on the shelf behind him shattered. Only then did they hear the gunshot. “Ken!” Ray shouted in alarm. “Get down! Everybody on the floor, now!” He barked. He jumped over the counter to check on his friend as the frightened customers scrambled to follow orders. He turned to Jason, who had already begun helping the older customers to get to the floor. “Jason, go back and make sure Min and Chad stay put!” he commanded. Hadley nodded and went immediately, keeping his head down to avoid being the next victim. “10-4. Searching the perimeter now.” It seemed like an eternity, but it was really less than a minute before Gary was back on the radio. “No one visible in the immediate area, Chief…wait—I see movement across the highway…I’m responding now. Subject is armed and on foot, running northwest from the far end of the park.” He was breathing hard, the adrenaline taking effect. “About two hundred, two-twenty yards out.” The sound of the patrol car’s motor screaming up to redline could be heard inside the café. Then the thudding and bumping of the Crown Victoria muscling its way over the poorly maintained road and through rough brush, dodging the trees as the deputy gained on the shadowy figure that he could now see was carrying what appeared to be a long-barreled assault rifle and was wearing camouflage BDUs and a ski mask. Gary got as close as he could then he drew his weapon, veered right, braked hard, opened his door and took aim.